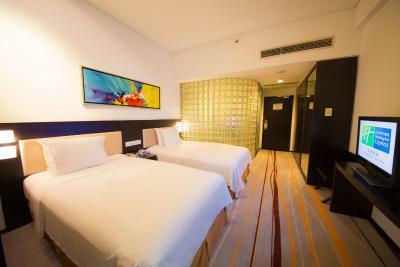 Lock in a great price for Holiday Inn Express Gulou Chengdu – rated 8.7 by recent guests! The room is good. They offer an extra breakfast with option for non-chinese. Very new hotel. Everything was very clean and modern. The first impression of this hotel was very bad. Up on arrival at the hotel we were told by the manager they don’t accept foreigners but we argued we have confirmation from Booking.com an after a conversation we were allowed in. Arriving at the room we cannot imagine a room would smell so bad and it is like it has never been opened for months. You can’t touch curtains it is full of dust, rooms located at the main road have no either sound proof or windows couldn’t close so it was the most disturbing night. Bed cover, towels are in worst hygiene standards and you could get some sort of disease from that. The toilet paper cover had rotten and it looks someone vomited on it. Never recommend this hotel for any reason mind person. Am writing this 4:00 am as I couldn’t sleep due to heavy sound pollution from roadside vehicles. The location was good, with easy access to public transportation. This hotel is very comfortable; nothing fancy but everything you need. The clean laundry facilities also came in handy. Perfectly located among restaurants and opposite a convenient store. 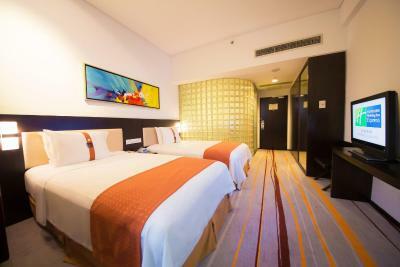 Neat room, good breakfast, convenient to public transport, helpful staff. After a 15 hour flight, this was just the respite we needed. Everything was so clean and well kept. The staff was so friendly and the breakfast was awesome. It had a nice mix of western and Asian choices. We wished we could have stayed here longer. One of our top picks in Chengdu.Holiday Inn Express Gulou Chengdu is located in Chunxi Road Pedestrian Street in downtown Chengdu. 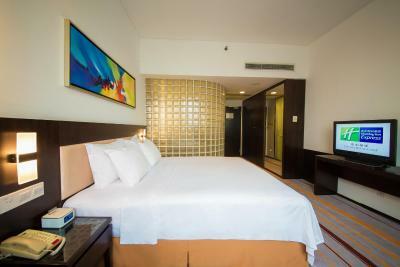 It offers great-value accommodations with authentic Sichuan cuisine and rooms with free Wi-Fi access. 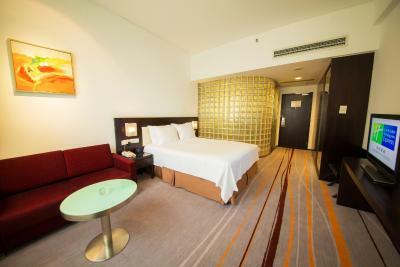 Air-conditioned rooms at Gulou Chengdu are fitted with a flat-screen TV with cable channels, sofa and a work desk. 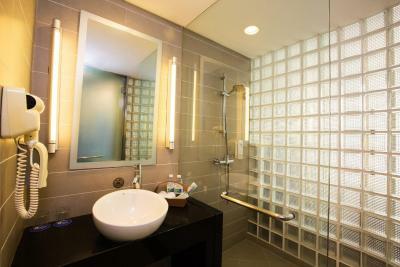 Each room has private bathroom with hot water and shower amenities. Guests can find luggage storage at the 24-hour front desk. Free parking is provided. 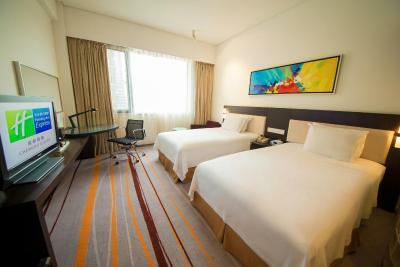 Holiday Inn Express Gulou Chengdu also offers laundry services and ticketing services. Holiday Inn Express Gulou Chengdu is a 10-minute drive from Wuhou Temple and Jinli Ancient Street. It is a 15-minute drive from Qingyang Palace and Du Fu's Thatched Cottage. Chengdu Shuangliu International Airport is about 30 minutes' drive away. Qingyang is a great choice for travelers interested in history, sightseeing and friendly locals. This is our guests' favorite part of Chengdu, according to independent reviews. 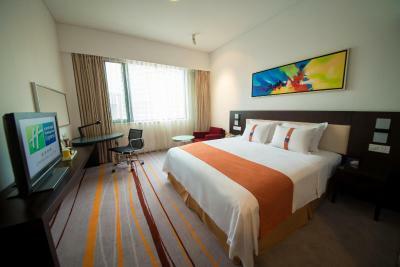 When would you like to stay at Holiday Inn Express Gulou Chengdu? 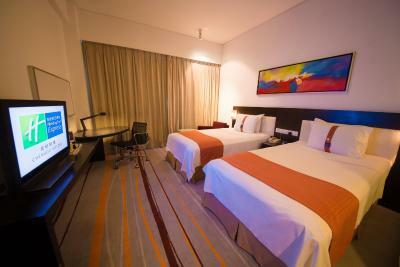 Room comes equipped with a flat-screen cable TV, an electric teakettle and has a private bathroom with a shower. Private parking is available on site (reservation is not needed) and costs CNY 10 per day. 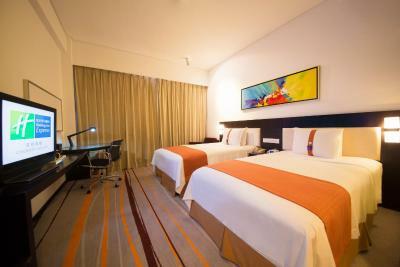 Twin room comes equipped with a flat-screen cable TV, an electric teakettle and has a private bathroom with a shower. This double room features a soundproofing, satellite TV and electric kettle. Holiday Inn Express Chengdu Gulou's elegant marble lobby offers a relaxing arrival point in Chengdu's Qingyang district. 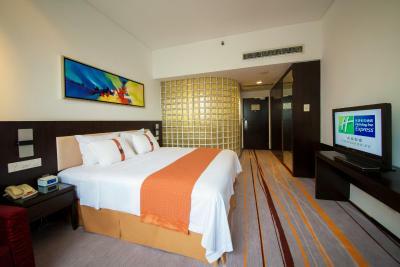 The hotel is a 30-minute drive from Chengdu Shuangliu International Airport. Chunxi shopping street and local businesses are a 20-minute walk away, and we are 11km from Chengdu North Railway Station. Our staff can order taxis to help you get around. You can host events for up to 120 people in one of the hotel's 3 meeting rooms. There's wireless Internet throughout the hotel, and you can use our 24-hour Business Centre. 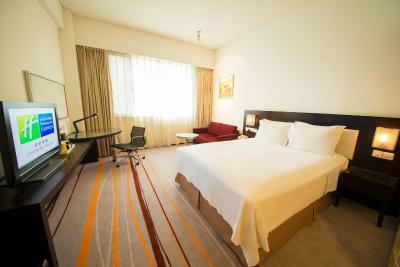 The hotel's location puts you within walking distance of Tianfu Square at the heart of Chengdu. Visit Chunxi pedestrian street for Chengdu's best shopping, a 20-minute walk from Holiday Inn Express Chengdu Gulou. You can stop for tea at one of the traditional teahouses nearby, and sample local Sichuan hotpots. Watch folk performances at the Sichuan Opera Theatre, 10 minutes away. Our complimentary breakfast buffet offers Chinese and western choices, including dumplings, eggs and fresh fruit. You can unwind in our stylish Great Room, and soak in the buzz of the city through its large windows. Hotel surroundings – This neighborhood is a great choice for travelers interested in history, sightseeing and friendly locals – Check location Great location - show map Guests loved walking around the neighborhood! House Rules Holiday Inn Express Gulou Chengdu takes special requests – add in the next step! Greatwall Peony Dragon Pacific Jin Holiday Inn Express Gulou Chengdu accepts these cards and reserves the right to temporarily hold an amount prior to arrival. Holiday Inn Express Gulou Chengdu accepts these cards and reserves the right to temporarily hold an amount prior to arrival. Hotel is centrally located. 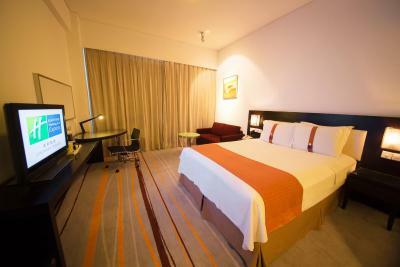 Room is of good size, nice bed and very good pillows. Breakfast has lots of choices. Plenty of restaurants nearby. Easy walk to metro station. Taxis is not hard to find. Staff is very helpful. Location self service washing machines and dryer. The care the front desk took to make sure we were ok. Great directions to attractions and help with printing. Smiling faces. Coffee machine at bfast was slow.. No fridge in room. Aircon was turned off ??? Only a couple of blocks away from centre of town. Subway close by and many restaurants. Rooms were a good size with some English news and movie channels. Bfast was a good spread. Rooms had a jug and coffee. Bed was comfortable and room had a working room safe. We had a lovely stay. The girls on reception were so very lovely and some even spoke very nice English. A really nice place to stay. The bedrooms were spotless and the showers were amazing!! It is kind of old need repair esp elevators ! When you press the button it has electricity! Not safe not cool ! Everything was old . Rooms also not good I usually stay at holiday inn but this one was crazy old compare the price they offerd . There was no fridge in the room. Besides, there was no hook in the bathroom, where we could hang our clothes, as we had a shower. The room was very clean and the bed very comfortable. The staff at the reception was extremely friendly and helpful. They did their best to help us with every problem that we had and that was very easy, as they speak standard Chinese and very good English. Metro is about 700mts from hotel but taxis plentiful and cheap. 10 yuan ($2 au) to metro. The hotel can do even better if they could enhance the quality of food served during breakfast by perhaps decreasing the variety offered. Pointless to have many foods offered but with taste & quality compromised. Well-trained staff and very clean room. It is convenient as a base for travelling around Chengdu. Lovely hotel close to Tianfu Square and metro.many food outlets close.